Beginning on our first newsletter of 2014, tomorrow, you begin to find yarn inspiration, project ideas and more within our Crochet Crowd Newsletter and Website featuring Lion Brand Yarns. We know our fans use Lion Brand Yarns as it’s available in nearly all major retailers across North America. Lion Brand has thousands of free patterns within their index. They are leading the way in social media with presenting yarn from an average person to really high end looks. It’s amazing what the same yarn can do by just changing the concept, stitching or purpose. It’s really inspiring to be honest with you. Lion Brand Keppi Yarn. A full kit, with pom pom included! We’ve been hearing a lot about this new product called Keppi by Lion Brand. There are 8 different colour combinations in this new yarn line. When you examine the cost of the product, you get really interesting and vibrant yarn and the pom pom is included. It’s really brilliant. Like we already do with Red Heart Yarns, we are going to provide 1 Gallery in each newsletter featuring up to 6 patterns. Our very own Diva Dan is going to comb through the library and come up with interesting galleries to inspire you. You can click the picture if you are inspired to get the free pattern. It’s simple. The first time you click a free Lion Brand Pattern, it will take you directly to the page but will require you to either register for a membership or use your existing membership to get to the free pattern. 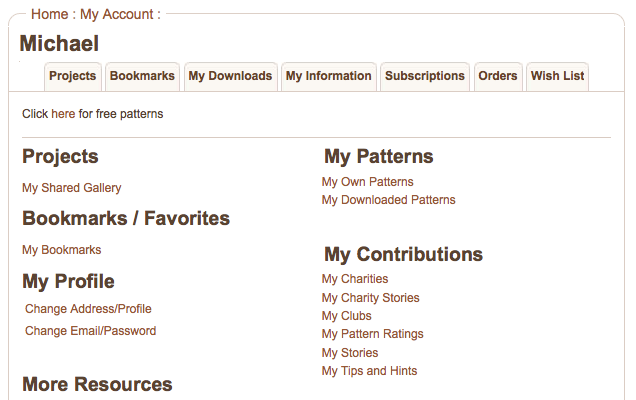 Once you log into Lion Brand, all the rest of the free patterns on our website will jump you directly to the pattern as it knows you are already logged in. Once you exit out of the internet browsers and come back to Lion Brand at another time, you will need to log back in to get access to the free patterns. Membership has it’s rewards. You can use your account to do many things. You can upload your Lion Brand Projects to a shared gallery. You can design your own patterns. This is really neat! You can see what patterns you have looked at before so you can come back to it at a later time and not worry about trying to remember a specific name to find it again. Our role with Lion Brand is to share inspiration within our newsletters, website and blogs. Due to a jam packed video editorial schedule there will not be any video tutorials created using Lion Brand Yarns or Lion Brand Patterns for 2014. We look forward to a fun filled inspiring year with Lion Brand Yarns for 2014. This entry was posted in Announcements and tagged Craft, Crochet, crochet crowd, Free Patterns, Lion Brand, Lion Brand Yarn, Mikey, Pattern, Yarn. Bookmark the permalink. I like the finding a pattern you looked at before part. A pic I saw of a knitted afghan has been haunting me. I think I finally figured out how to do it in crochet, so now I need to find the pattern again. Great to read that someone – thanks Diva Dan – will be keeping an eye for interesting Lion Brand projects. We can now get lots of Lion Brand yarns in the UK so will be able to try new projects. Looks like a yarny year. One more good reason to love The Crochet Crowd!